The S-type 750 Commando was introduced in 1969 alongside the Fastback, itself a tweaked version of the initial Commando, and the R-type Roadster. The S was intended to capture the hearts and wallets of the American market and it wedded Norton’s isolastic chassis to the street scrambler styling of the P11 desert sled which had been discontinued the previous year. The S-type was slimmer, sleeker and more shiny than the original Commando with a smaller petrol tank and separate, stepped seat. 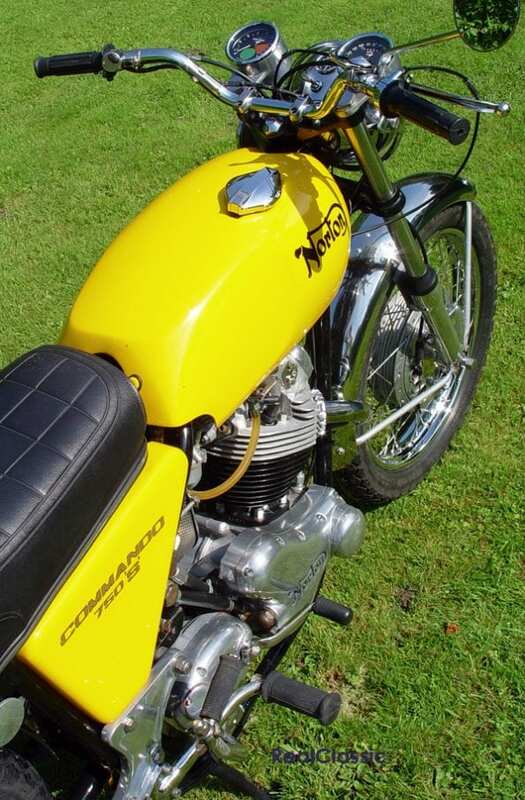 The ducktail disappeared along with the fork gaiters and chunky mudguards were replaced by a flashy headlamp trim, slim chrome guards, shrunken sidepanels, scrambles bars and a stumpy cut-down chainguard. Its most striking feature was that chrome-plated high-rise exhaust system with reverse-cone megaphone silencers which not only looked the biz but also gave greater back-pressure and a mild power boost. The engine’s compression ratio was up but so was vibration because the silencers now bolted direct to the frame. Cycle magazine tested a 750S alongside six hot competitors in 1970. 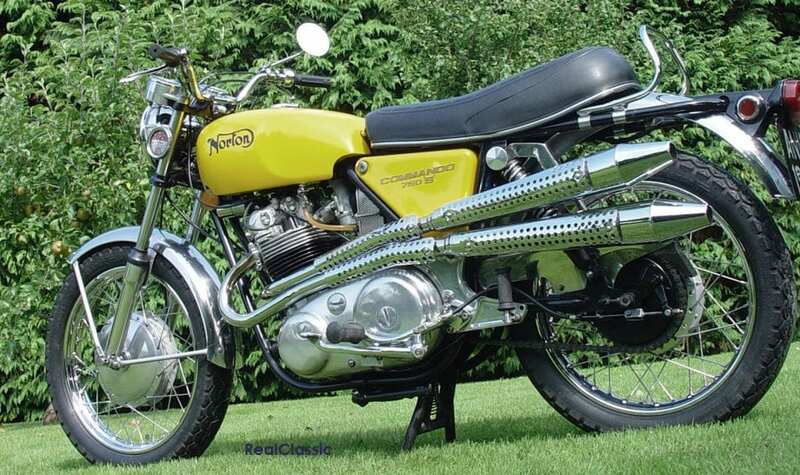 The Norton covered a standing quarter mile in 12.39 seconds, beating the Rocket 3, Trident, CB750, Suzuki Titan, Harley Sportster and even the mighty Kawasaki Mach III. ‘Give the Commando S a fistful of throttle and your arms feel as though they’re being pulled out of their sockets!’ said Motorcycle Mechanics. The Commando’s braking didn’t merit so much appreciation. 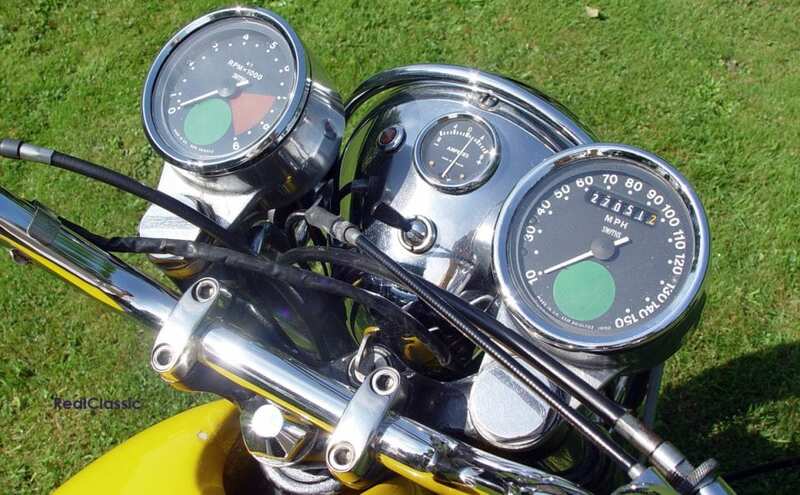 It was considered acceptable by the home market, although the American testers always criticised it for its propensity to fade and it was rated the worst in the seven bike shoot-out. Back in Blighty, Motorcycle Mechanics reported that ‘braking from any speed was excellent’ but these days braking from 60mph feels pretty marginal when you’re surrounded by ABS-equipped traffic. The S-type did benefit from a vital tweak to the original frame design and its ignition points were relocated to a more accessible location in the timing cover, while the rev counter drive moved to the front of the engine (the R-type didn’t get these mods and nor did the Fastback until late 1969). Most S-types you see these days are yellow, like the one pictured here, but they were originally built in Fireflake Red and Sapphire Blue. The colour was less important than the chrome, of course, and with its exposed, polished forks the 750S didn’t look desperately practical to UK bike riders. Just think what the salt of winter’s streets would do to all that brightwork! The home market café racer crowd weren’t wildly happy with the hung-out-to-dry handlebars and 2.2-gallon petrol tank, either. Over in the States the S-type fared better than the original Commando had, and its butch off-road looks found many more admirers than the graceful Wolff Olins design. Still, it didn’t sell in vast quantities. 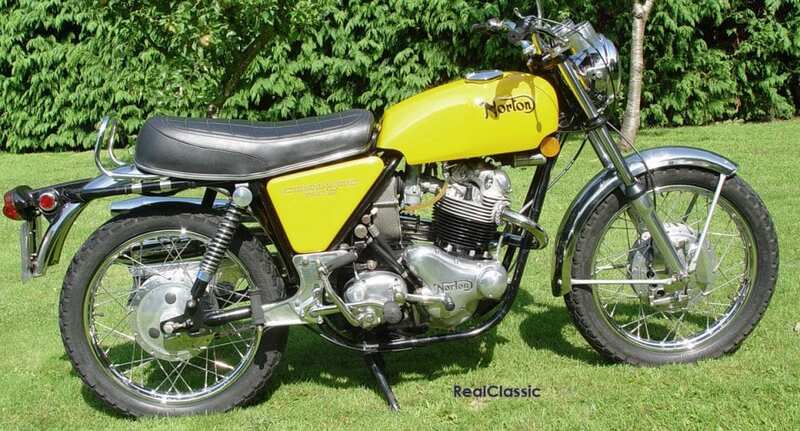 Honda were building 2000 CB750s a month at that time; Norton could turn out 600 Commandos in the same period. They needed a best-seller for 1970 and so they built one: the Roadster. You might think that the Roadster was a development of the R-type, but really it’s much more like the S-type. Engineer Bob Trigg (who later moved to Yamaha and oversaw development of the TDM850) combined the slimmed-down silhouette of the S-type with the road-going practicality of the traditional British twin. The high-rise exhaust pipes were jettisoned but in most other respects the S-type’s design lived on as the Roadster – it even used the peashooter silencer from the S and kissed goodbye to the old Atlas pipe forever. The Roadster hit the spot. 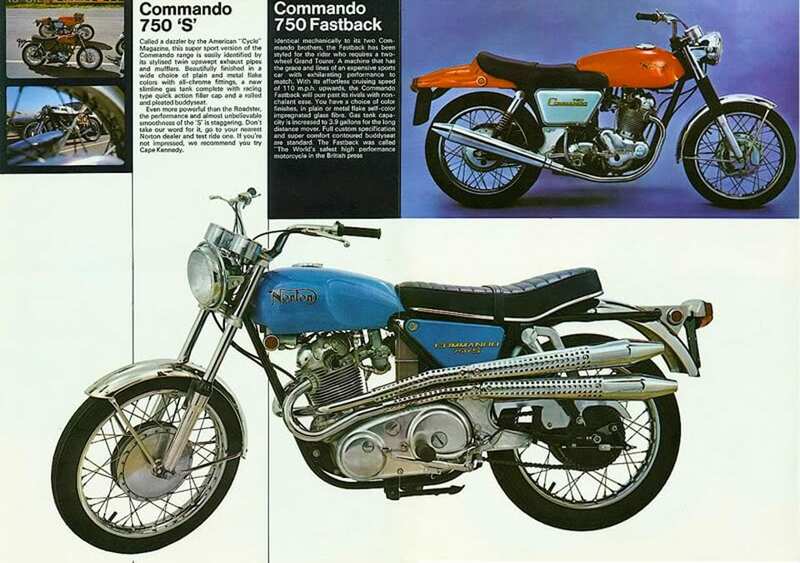 It became the best-selling version of the Commando in the USA, despite the introduction of the SS and the Hi-rider, and wore the nickname ‘Freeway Flier’ with pride. Better yet, it was a style of motorcycle which the British buyer could love, one which combined lean good looks, easy handling and year-round rideability. So the 750S may have only lasted for a couple of years but its successor lived on, right until the end of the Commando line. These days, of course, the wheel has turned completely and the models which weren’t in fashion when they were new have become highly desirable to the classic cognoscenti. So a Fastback may set you back rather more than a Roadster, and you’ll definitely pay for the privilege of owning a seldom-seen 750S. 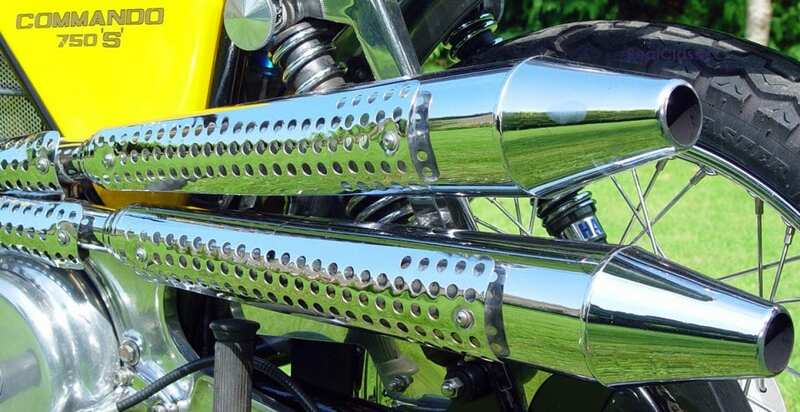 But look at those pipes, shining in the sunshine. Worth every penny, surely?